Hi all, I have my first reef tank and are at the point where I want to start adding more corals. I have finished stocking all the fish I want and just added a BTA which is the last mobile animal I plan to add. Now for the sessile ones. I am not intending to be too ambitious and are happy to stick with robust simpler corals. I also have no real preference between softies, LPS or SPS - would like a bit of a mix I guess. My tank is a Red Sea Reefer 250, lighting is a 3 cluster MaxSpect RAZR 420R running a cycle with max (running a cycle at max 50% both channels), flow comes from the Torque DCT-4000 return pump (running 100%) and a MaxSpect Glamorca-GP03 wave maker (running a cycle with max 50%). I run a skimmer, Marine Pure balls, Polyfilter and currently Phosguard in a media bag. I use Aquaforest Reef salt and component 1+2+3+ dosing daily via Apex DOS units. I am currently also dosing 0.5 ml Phos-Correx daily as I am trying to get GHA under control and phosphates to a level I am happy with. RODI water only. The tank is now 8 months old. SG 1.024, Ca ~450, Mg 1400-1500, PO4 currently 0.06 ppm, Ph 8.4, kH 8.4-9.4, temp 25 (rising to max 26.7 in summer when my chiller kicks in). NO3 zero based on my API kit so likely actually a little higher (others tested with Red Sea kits and Apex). So not completely stable yet but getting there. Fishies are a Yellow Tang, Clownfish pair, Fire Goby pair, Orchid Dottyback, Six Line Wrasse (peaceful so far!) and a Lawnmower Blennie. All getting on very well with each other. Inverts are a Coral Banded Shrimp, Sand Sifter Starfish, Nassarius snail, Hermit Crab and 4 Trochus snails. Also a BTA which is now hosting the Clowns. Corals are a Neon Green Sinularia which is currently the dominant specimen, a brain coral, a few purple Zooanthids (Purple People Eaters I think), a few mushrooms, a small colony of Xenia which came from the LR and two Fungias which also came from LR. I have a plate coral which is nearly dead as it did not survive the GHA outbreak and my young tank. BTW if you can help me identify my existing corals more correctly I would love that. Aquascaping and design is certainly not my forte. I am very practical and inventive but not creative. I would love to hear some suggestions as to what corals I could consider adding and where. Please also feel free to suggest any changes to the aquascape - as I said this is not my forte and I won’t take any offence! Love to hear any thoughts the community has and thanks in advance. Last edited by Tastee; 07/12/2018 at 02:33 AM. 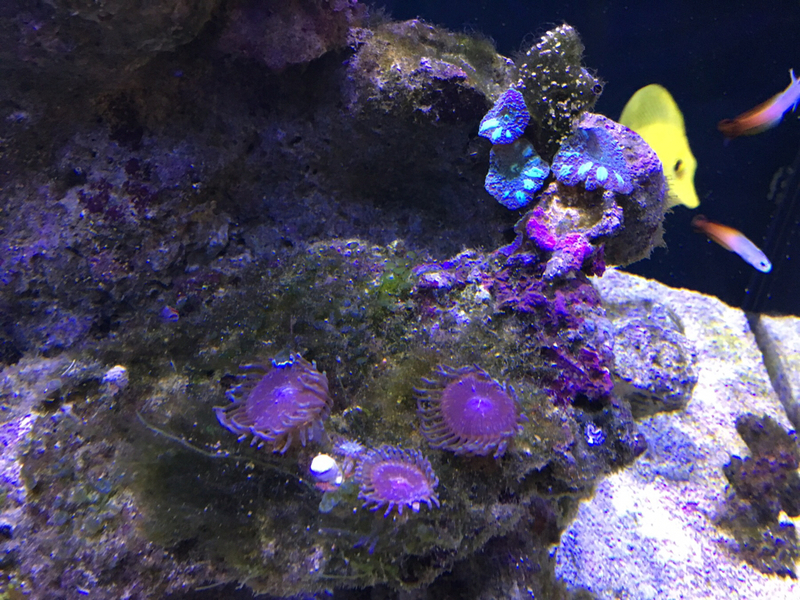 I’ve had luck with candy cane corals and some euphillia like hammers in a young tank. Be careful about the zero nitrates and higher PO4. Sent from Christopher’s Pocket Pal. You indicate that you would like a mixed tank. Keep in mind that the conditions for SPS are very much different than LPS and softies. Running a "mixed reef" is certainly possible, but is one of the most difficult due to the varied needs of the SPS versus others. As for corals, I will throw my vote for Scolymias, not overly demanding of water, and likely one of the most vibrant colours available. The downside is price, but you easily see why. As any Stoney, needs calcium at around 420, mag around 1300, Alk around 8.5. All need some nitrate at 2-5 ppm or so, and phosphate around .02-.05 or they starve. I see Green hair algae (sorry), you'll need to control this before adding anything more. Long term phosphate down to .02-.04, maybe try a GFO, I use ROWA, brings it down fast. Last edited by Uncle99; 07/12/2018 at 06:19 AM. Corals/Fish choice as well as "aquascaping" are such a personal thing IMO..
Find what YOU like.. Research its needs to ensure YOU are able to meet them and enjoy..
I’ll definitely take a look into Scolymias. I am working on the GHA and it is slowly subsiding. My PO4 is currently 0.06-0.08 ppm and I am dosing 0.5 ml of Phos-Correx each night spread over several hours to help bring it down. When I started this the PO4 was > 0.16 ppm. I am using a Red Sea Phosphate Pro test kit and strangely my tap water, my RODI water and my LFS’s RODI water all tests at 0.08 ppm. My RODI TDS meter shows 0. I don’t know if this is a test kit error or not. For now I’m sticking with the Phos-Correx daily for a few weeks to see how that helps. I am also running Phos-Guard in a media bag in the sump inlet but I am not sure it is doing much due to low flow. If I don’t think I’m making headway I will probably buy a Hanna Ultra Low Phosphorus checker and see what that tells me. I don’t currently have a reactor and are a little pushed for space in the sump to fit one. I am thinking about changing my sump plumbing to hard plumbing, and if I do so I could hopefully fit a reactor and run it off the Chiller pump, and either run Phos-Guard or GFO in that as a longer term solution. Here are some better pictures of the current corals. Please note these are a little older and GHA is nowhere as bad now. I assume that what I know as the Brain coral is the Favia. Interestingly I had to move it as the Torch started stinging it. I wasn’t thinking it could be aggresive itself. From a quick google search it looks like this is a Dragon Soul Favia. I certainly see it’s polyps extending well out every time I feed Mysis Shrimp. Within 10 mins it is filter feeding for all it is worth. And the little Xenia colony that self-sowed. Last edited by Tastee; 07/13/2018 at 01:59 AM.